Tulips are a favorite springtime favorite flower. Thanks to modern growing technology, most tulip varieties are available from our superior partner farm year round. Bulk wholesale tulips come in a variety of brilliant colors, and are easy to arrange into elegant floral arrangements. 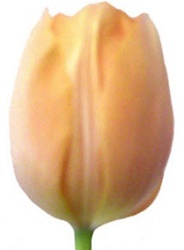 Tulips ship in bud form, but quickly open and continue to grow after re-hydrating. Our standard tulips have an average length over 14 inches and a head size of 1-2 inches. Bulk Tulips are shipped in 10 stem bunches from our California grower. If you care properly for your wholesale Standard Tulips, they should last at least 5-8 days in the vase. Proper flower care begins with the timing of your delivery. We recommend you schedule your flowers to arrive 3 days before the actual event. For a Friday or Saturday wedding your flowers should be delivered on the Wednesday before. Normally they will arrive before 10:30 am, depending on your service area. 1. Cut tulip stem ends to create fresh surface to absorb water and remove any faded stem base. 6. Tulips are sensitive to ethylene (which comes from fresh vegetables and fruits, especially bananas) which makes them open faster, but also age faster. Depending on your preference, place them away from or near fresh fruit and vegetables. 7. After a day, your arrangement may seem a bit larger - tulips continue to grow for about a day after theyre placed in water. Particular varieties vary over the course of the year. So we list and sell them by color, not variety. We will do our best to match the color you order with what is available. If you order a color that is not available for the time you desire and does not have a close match, we will notify you and suggest alternatives. Prices are based on availability and are subject to change due to weather and market conditions. Due to variation in tulip varieties and monitor resolutions, the exact colors of this tulip may vary to some degree.